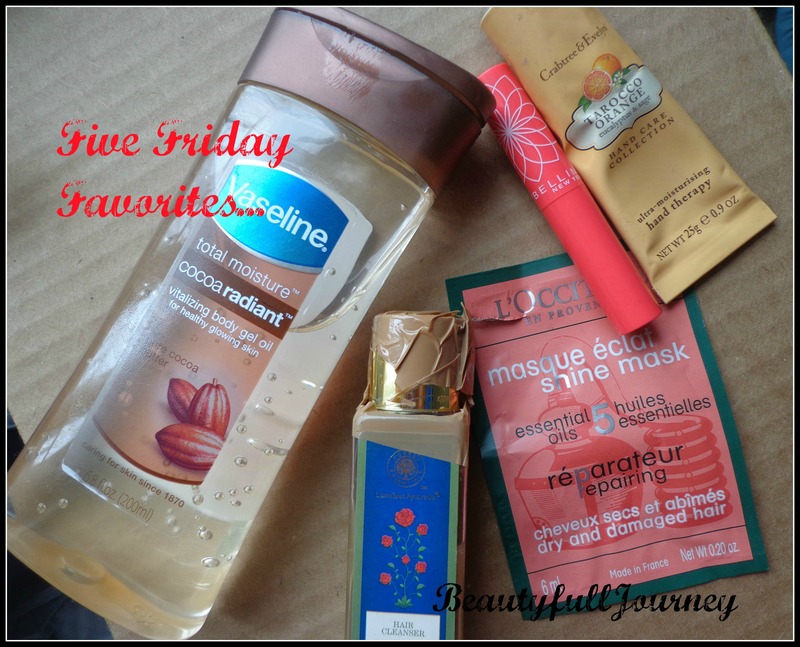 After a little long time, I’m back with my five Friday favorites. L’Occitane repairing hair mask ~ I’ve been using the shampoo and conditioner from this range since quite some time and I got a few sachets of this repairing hair mask as samples with my purchase of the shampoo conditioner. Each sachet got me around 3-4 uses from it and I’ve been in loveeee with the hair mask. And now finally I’ve got around to buying the full size of this, it was super expensive and broke my heart when I bought it but the mask does give me really nice hair so well!!! Crabtree & Evelyn hand cream ~ I’m loving all three of these, and I’ve finished using the pomegranate one. I just reviewed these yesterday here! Vaseline cocoa radiant body oil ~ this is so so so hydrating!!!! It makes my skin super soft and my skin even smells so good after using this! I will review it soon, before this winter ends! Maybelline color bloom in peach blossom ~ I got around to using this again after a really long time! And aah as always I love these so much! Especially this peach one looks so natural and pretty on my lips:P I’ve reviewed this here. < Previous Crabtree & Evelyn Hand Cream trio Review. Next > March 2014 Empties.